Campitelli is most likely a corruption of Capitolium the Latin name of the Campidoglio hill; another theory links Campitelli with the fallen capitals (It. capitelli) of Roman temples near Piazza Montanara. It includes the area around Campidoglio and the hill itself, the Palatine and most of the Celio hill. It borders to the north on Pigna, to the east on Monti, to the south on Ripa and to the west on Sant'Angelo. 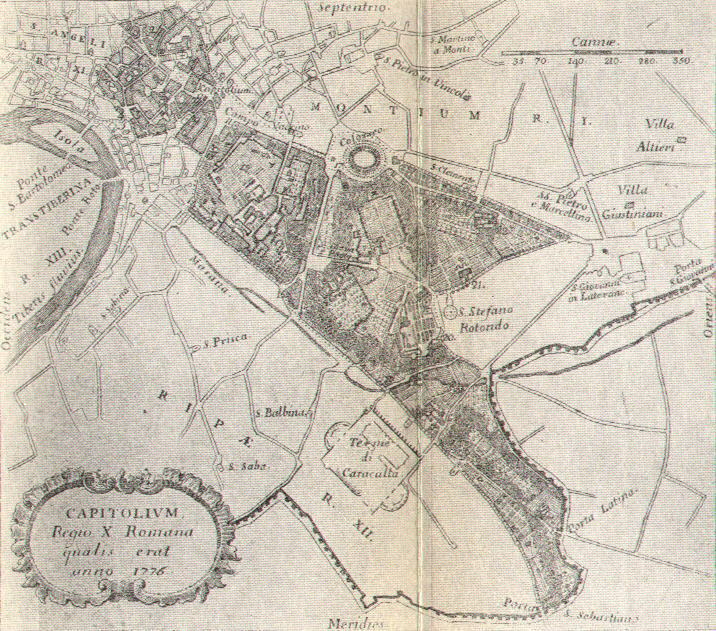 In the XVIIIth century only the area around Campidoglio was populated while the rest of the rione was split into villas and farms. 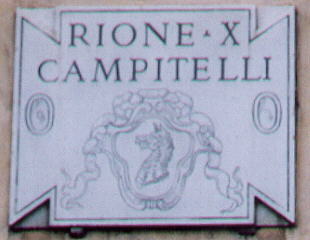 The symbol of Rione Campitelli is a dragon's head. Rione Campitelli includes some of the most imposing ruins of ancient Rome from those of Palazzo Augustale to those of Colosseo. The statue of Marcus Aurelius, the arches of Septimius Severus and Constantine, the temple of Castor and Pollux, the gates of Porta Latina and Porta San Sebastiano are other fascinating Roman monuments of Rione Campitelli. Notwithstanding the loss of the medieval quarter around the Campidoglio hill, the rear side of Palazzo Senatorio and Santa Maria d'Aracoeli offer interesting examples of medieval architecture. The Campidoglio hill has always been seen as the symbol of the city of Rome in its non-Christian aspect. Paulus III commissioned Michelangelo with the redesign of Piazza del Campidoglio to welcome there the emperor Charles V who was returning from his conquest of Tunis in what was almost a re-enactement of the triumphal processions of ancient Rome. In the XVIIth century Carlo Rainaldi completed Michelangelo's design of the Piazza and built one of the finest churches of Baroque Rome: S. Maria in Campitelli. 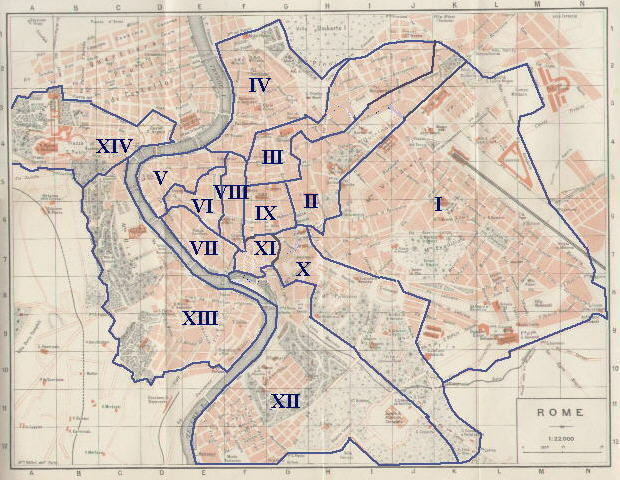 a) left map: red area: the buildings on the northern side of Campidoglio were pulled down to make room for the Monument to Victor Emmanuel II and later on to obtain a large square at the foot of the steps leading to S. Maria d'Aracoeli and to open a large street leading to Teatro di Marcello. b) left map: green line: the Palatine, the southern side of Campidoglio and the valley between the two hills have been excavated and today they form a large archaeological area. 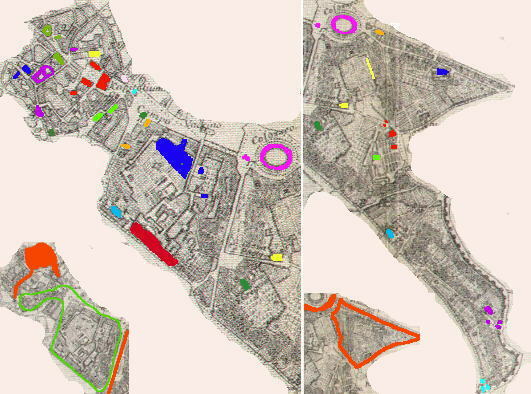 e) right map: red line: it marks an area where most of the buildings were erected after 1870. The different colours group the monuments which are shown in the same page (because of the scale of the map a few minor monuments were omitted). - Portico di Monte Caprino With monuments of Ripa. Chiesa di Santa Maria della Consolazione With monuments of Ripa. - Ospedale della Consolazione With monuments of Ripa. 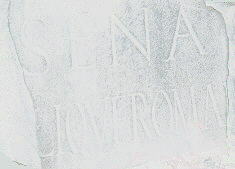 - Tempio di Castore e Polluce With monuments of Monti. Chiesa di Sant'Anastasia With monuments of Ripa. - Casino Fini With monuments of Monti. Chiesa dei Santi Quattro Coronati With monuments of Monti. Chiesa di San Sisto Vecchio With monuments of Monti. 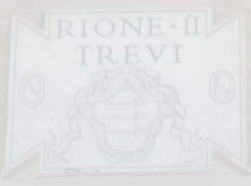 You can start your tour of Rione Campitelli from S. Pietro in Carcere. You can also have a look at it from the Janiculum: Campidoglio, Colosseo and Santa Sabina.